There are some truly tough questions in life. Why are we here? What’s it all about? What happens after we die? This is not one of them. Take it away, Jason Mander, the ironically titled “director of research and insight at GlobalWebIndex”. And that was all they heard from him forever and ever. Wouldn’t it be nice if we could just stop them there, though? At the jerky interrogative headline? Man, the Macalope wants to live in that world. Instead of this world with its stupid headlines. God, how he hates it. Now, are you ready for some wacky comparisons? Remember to keep your hands and feet inside the car at all times because this logic is going off the rails, through some brambles, down and embankment, up a gigantic ramp, up, up, up into space and into the sun. As Samsung barely manages to climb out of the ditch it drove itself into by getting out-Apple-copied by Xiaomi. For the purposes of this article, we will define that as “winning”. …Apple is having a nervous start to the new year. Please hold your eye rolling until the clown car has come to a complete stop and all the clowns have exited the vehicle. The last device Apple made out titanium was discontinued ten years ago. It was, however, the TiCurtain, so that part is completely right. …at Apple and a core problem is materialising. That problem is the iPhone, a device that still accounts for around two-thirds of Apple’s revenue. And nobody buys iPhones anymore. Too popular. Samsung is lauded for making all kinds of iPhone-like devices and eking out a profit. Apple, on the other hand can only have problems no matter what it does. Is Mander insinuating that Apple is shipping a smaller phone based on what was announced at Mobile World Congress? Because that would be hysterical. For starters, rumors of an iPhone 5se have been around for weeks, not to mention the time it would take to develop such a device. Besides, clearly Apple is shipping a smaller phone because the Macalope has asked for one ever since the iPhone 6. That much we all can agree on. This would help spread the Apple payment system to places such as India and China, but would also spell the beginning of the end for a phone that has always been able to consistently command premium pricing, based on little more than brand design. Is “brand design” shorthand for “a brand with an incredibly high customer satisfaction rating based, in part, on its strong design ethic”? That’s probably what that means, right? Let’s be clear about what an iPhone 5se or SE or whatever it’s called will be. It will not be a “cheap phone”. Yes, it will be cheaper, but it’s going to hurt the Apple brand as much as the iPod nano did. Which is to say live up to it in every way. Surely 2016 is the year that people will finally realize that Apple products are too expensive and start buying commodity phones from other vendors. Also, Linux will rule on the desktop and the Cubs will win the World Series. It’s funny that that last one has the highest chance of actually happing. …the Apple Watch is tethered to the iPhone but the Samsung Gear S2 can work with any Android phone, so arguably has wider appeal. You could argue that! 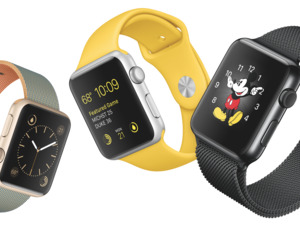 And then you could wonder why Apple sells more smartwatches than anyone else. You could lie awake at night, staring at the ceiling, just knowing that there could be nothing wrong with your logic and surely it was reality that was wrong. You could do that. It seems like a lousy way to live instead of relying on actual, observable events but… whatever. It’s your life. Samsung is like a storm raging inside you. How is it that every year is the first year that Apple will have to face strong competition from Samsung? Or Microsoft. Or Google. Or Xiaomi. It’s because pundits see these companies moving forward and simply assume Apple will stand still. Why they assume that is anyone’s guess. Possibly they worked as hatters in the 1800s. We just don’t know. Oh, sure, add that to the list of things that are totally going to happen in 2016. Virtual reality is certainly promising, but it has a way to go before it takes off. …but there’s still a long way to fall from the tree before Apple has to panic. Just an FYI, the rest of us knew that way back up at the headline.